In addition to our preseason rankings, The Eighth Man staff will be releasing a series of articles focusing on the top 20 teams, counting down from 20 to one. Each article will be written by two members of the staff, one who believes the team will live up to or exceed expectations and one who thinks they will come up short. Texas State Univeristy is the enigma of the Southwest Region. 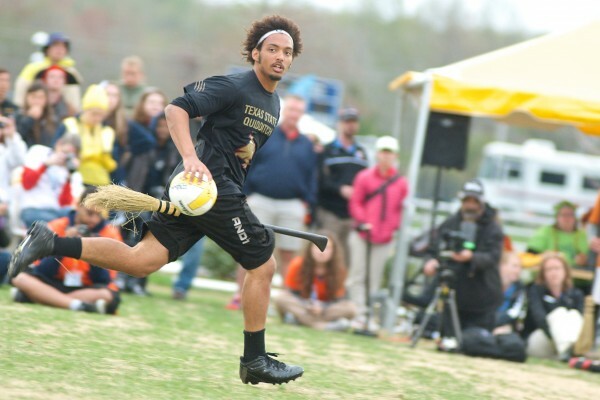 They surprised everybody at World Cup VII by making it to the finals when objectively better teams like Texas A&M, Baylor University and Lone Star Quidditch Club saw earlier exits. Despite being World Cup finalists, many people felt they did not truly prove themselves as an elite team all last season. Texas State has spent years in the second tier of Southwest teams; however, this is the year they finally bridge the gap and join the upper echelon of USQ’s toughest region. Of the top Texas teams, Texas State lost the least amount of talent. While University of Texas lost star seeker Margo Aleman and Texas A&M lost Team USA power duo Drew Wasikowski and Becca DuPont, the Bobcats only lost their third-string keeper, Matt Zakrzewski. Pending a good recruitment season, Texas State should be able to easily overcome their loss and come away this season as a significantly better team. When talking about what makes the Texas State offense tick, many people bring up long-time player and Team USA chaser Eric Reyes. While Reyes is a great driver, utilizing his size, surprising speed and ability to consistently deflect bludgers, he is not the be all, end all for the Bobcats. Texas State has multiple scoring threats in Rich Kemp and Tyrell Williams, whose constant drives are essential to the success of the San Marcos team. Unknown until last season, Williams is perhaps one of the most proficient drivers in the region, using his speed and low-center of gravity to avoid getting tackled and delivering goals on valuable no-bludger opportunities. Aided by the skillful support of Lauren McGarrah, Romie Lof, Daniel DeRuiter and Justin Lopez, Texas State has a formidable starting line that can hold its own with the best of the best. In previous years, this team faced a problem in skill depth, which hurt them when playing the Texan elite. I expect Texas State’s offensive personality to receive a complete makeover. While this team mostly relied on drives and quick, pass-and-shoot goals, with a new influx of chaser talent due to recruitment, they should be able to add complexity to their passing game. While the Bobcats may not be the hardest hitting team in the Southwest, they are not afraid to make tackles on defense, many times slowing down the offensive player just enough to get beat for a quick turnover. Key to the Texas State defense is the fearsome beater pair of Ryan Peavler and Beth Clementi. Last season, they stepped into the spotlight and are now considered one of the best sets in the game. Both players exhibit sheer athleticism, high game IQ and heavy physicality, making them a nightmare to face on the pitch. Adding to the depth of the beating corps is veteran Jackson Johnson, who is finally coming into the position and has proven himself as threat on the field. Two of the arguably most physical beaters in the Southwest region, Peavler and Johnson will be incredibly useful on offense as they clear lanes for their chasers by either trying to regain control or by using the 1.5-bludger strategy to create those precious no-bludger opportunities for their chasers. Now that Aleman will not be around to soak up the seeker spotlight in the region, I expect the hype to shift toward Texas State seeker Steven Gralinski. Gralinski moved up to the varsity team from the San Marcos Sharknados after the Southwest Regional Championship and he proved to be clutch for the Bobcats at World Cup VII. Texas State went seven for 10 throughout the weekend, two catches attributed to Eric Reyes, and the other five attributed to Gralinski. Gralinski is aggressive, fast and extremely hard to throw, making him a threatening seeker for almost any snitch. With aggressive on-snitch beating from the beater corps, it would not be a surprise to see Gralinski come away with numerous big grabs this year. If he can continue to improve his game, he will be the final piece Texas State needs to get a big win over any of the Big Four of the Southwest this season. Every year, people discount Texas State as a top-tier team. The past two years, Texas State has done little to prove them wrong. However, with all the pieces coming together, the Bobcats will finally break out of the second-tier and join the elite Texas teams as the best the world has to offer. At no point in the history of our sport was Texas State University in the conversation as a World Cup contender. Remember Texas State’s reputation before last season? Going into World Cup VI, they were best known outside of the Southwest for complaining that they were deserving of a top-20 ranking when nobody would give it to them. They proceeded to exit World Cup VI in the Round of 32 courtesy of a 30-point loss to Emerson College. In the 2013-14 season, their storyline was more of the same: “Texas State is the top of the Southwest tier two.” Conventional wisdom said that, sure, they could compete for a regional title in any other region, but they could not touch the Southwest’s four-headed monster of Lone Star Quidditch Club, Texas A&M, Baylor University and University of Texas. Look at them now. Texas State won their own place in history at World Cup VII as one of nine programs to ever play in a World Cup final. They looked like they were going to win it too, as they jumped to an early lead against the defending champions. To say that Texas State shut their doubters up in 2014 does not do justice to the show they put on. Will the doubters be back in 2014? Texas State comes in ranked No. 4 by Eighth Man analysts. It would seem that they have finally won the public over. The final Eighth Man rankings before World Cup had them sitting at No. 13, when only six or so teams were given serious consideration as possible world champs. At the beginning of last season, they were just outside the top 20. This year, they finally have limitless expectations. They fell as short of a title as anyone ever has and are losing very little. The team has to be thinking World Cup or bust. They have finally, undoubtedly earned the title of World Cup contenders going into this season. They will be great, but not great enough. Two things will undo Texas State this year: the massive target that is now on their back and luck. The Southwest is a prideful region, and the four-headed monster is not going away. Texas State did not win any games last season against Lone Star, A&M, Baylor or Texas. Those teams will play more aggressively than ever to try to prove that they deserved to be in the final game, had all four not collided in the Elite Eight on the same side of the bracket. Not just those four, but every single team is sure to prepare for Texas State like never before. No team will struggle to find clear game tape of them, and their players are no longer a secret. Ryan Peavler, Beth Clementi, Tyrell Williams, Richard McEvoy-Kemp… the team is now full of household names. The world knows it is not just the Eric Reyes show, which used to be the logline for preparing for Texas State. The eventual finalists spent a shocking amount of time in snitch range on their way. After an expected thrashing of Pot Five Eastern Michigan University, they were not able to end a game out of snitch range again until their Final Four match with Emerson, including an overtime loss against Macaulay Honors College, who could not make it out of pool play. They significantly improved as every game went on at World Cup, and I expect that team chemistry to carry into this season; however, it will not be enough. They need to show that they can be more consistently dominant over middle-of-the-pack teams to earn their Final Four projection. They have a great seeker rotation led by World Cup breakout Steven Gralinski, but all it takes is one slip-up at seeker to bow out of a tournament if they continue to struggle to take 40-point leads. I actually think Texas State will have a better all-around season this year than last. They will win some games against the elite, and no tournament title should be out of their reach. But at World Cup, an Elite Eight finish should not be a disappointment to them. They sniffed the grand prize in 2014, but that may be as close as they ever get.